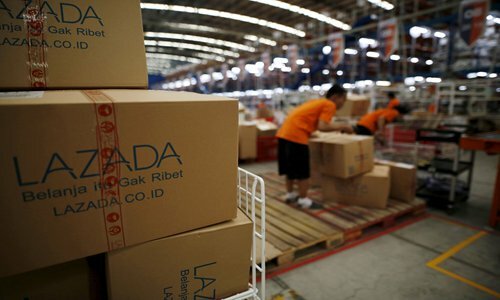 A view of a warehouse of online retailer Lazada in Jakarta, Indonesia on April 15, 2016. The 22-year-old Candy prefers to shop in physical stores instead of online, after getting back home to Singapore from London, because there is a shopping mall in every district in Singapore, plus they offer numerous restaurants and air conditioning. Even as she has multiple options of online shopping platforms, such as Zalora, Lazada, Fave and Shopee, she told the Global Time on Tuesday that she personally doesn't embrace online shopping as her Chinese peers do. Candy is not the only person who doesn't see the necessity of shopping online in Singapore as it is such a small country, which means transport costs and travelling time are not an issue. However, Chinese e-commerce giants and internet companies have already been breaking into the Southeast Asian markets for several years. They see great opportunities to open up the market place, even if the pace of development may not be as quick as was seen in China. 2018 saw harsh competition for the Chinese e-commerce giants in the Southeast Asian market. The Southeast Asian market is expected to reach $102 billion by 2025, according to joint research by Google and Singapore-based investment company Temasek in November 2018. The study added that the region's e-commerce market had already doubled in value from $10.9 billion in 2017 to $23.2 billion in 2018. The market's recent strong rise made the Chinese companies turn their attention to the e-commerce battle in Southeast Asia, as China's domestic industry had almost reached saturation due to the disappearance of the demographic dividend in the country. It is natural that Chinese e-commerce giants shifted their focus to the international market in recent years, in particular, Southeast Asia, where there are advantages of a huge population and a great location. Home to 650 million people - 8.6 percent of the total world population, Southeast Asia region has the largest group of overseas Chinese who are very familiar with the Chinese internet and e-commerce companies. Being geographically close to China, naturally brought Chinese e-commerce leaders to consider business expansion in the region. Additionally, the prime location of Southeast Asia connects three Continents (Asia, Africa and Oceania) as well as two Oceans (Pacific Ocean and Indian Ocean), attracting the international e-commerce firms, such as Amazon, to have a "inger in the pie." Considering the number of page views, customers' ratings and rankings on app stores, the most popular online shopping platforms in Southeast Asia are Lazada, Shopee and 11 Street, according to cross-border e-commerce development company TMO Group. Lazada, the top online shopping and selling business in Southeast Asia, was launched in 2012. What it achieves today is similar to the Chinese leading e-commerce company - Alibaba Group. In April 2016, Alibaba acquired a controlling stake in Lazada, "validating the potential of e-commerce in Southeast Asia and the role that Lazada plays within it," Lazada's official website wrote. This giant's ambition to enter the Southeast Asian e-commerce market has a long history. Alibaba hopes to establish a platform in Southeast Asia through buying Lazada to educate the local online shoppers, then to develop its online payment business, according to China's business media Huxiu. The report in August added Alibaba's final step is to combine the logistics system with the key local logistics resources in Southeast Asia, in order to develop the region's logistics via Alibaba's logistics arm, Cainiao. Lazada's sales volume in six Southeast Asian countries (Indonesia, Malaysia, the Philippines, Singapore, Thailand and Vietnam) on the "double 12" shopping spree, initiated by Alibaba, was 30 times normal volumes, China's technology media 36kr reported in December, 2018. Throughout the three day shopping festival, over 55 million goods were sold. Another big move took place in the leadership of Lazada in April 2018. Peng Lei, one of Alibaba's founders, took the position of Lazada's new chief executive in Singapore. Its former CEO Maximilian Bittner will continue to serve the company as a senior advisor. However, only after nine months, Peng stepped down from her position as chief executive, but will remain Lazada's executive chairwoman, said the company on its website. The restructuring came after the rapid growth of Lazada's rival Shopee, which is part of China's internet giant Tencent-backed Sea Group. Although Lazada leads the way in terms of website visitor volume, it doesn't come out top on the iOs and Android download lists. Shopee has almost taken the place of Lazada in recent years, making the competition of e-commerce in Southeast Asia much harsher. Singapore-based Shopee started three years after Lazada, but remains a strong competitor. In 2018, Shoppe's traffic data showed an astonishing increase of 135 percent from Q1 to Q4, the cross-border e-commerce platform cifnews.com reported on Monday. In addition, Tencent has invested in Indonesia-based transportation unicorn Go-Jek and accommodation and flights reservation provider Traveloka, clearly revealing its objctives in the Southeast Asian e-commerce market. Compared with Alibaba and Tencent, China's second largest e-commerce player, JD.com adopts a standalone expansion model. It established the Indonesia operations as early as 2015, putting its business into the market of Indonesia. At the end of 2018, JD.com signed a cooperation contract with Thailand's Ministry of Commerce, promising to provide technical support to the country's logistics and management policies. The company has established a logistics transport network to achieve a same day delivery service. JD.com founder and CEO Liu Qiangdong expressed his expectations for Thailand's economic development. He sees Thailand as the company's opportunity to expand its footprint in the Southeast Asia, business news portal China Knowledge reported in December, 2018. The report also added that the partnership can enjoy special training on cross-border e-commerce, analytics on consumer insights, digital payments and logistics, as was detailed by Chairman of Central JD Commerce, Yol Phokasub. The biggest change in the e-commerce market could be seen through the payment method change. It is clear that in China most people have abandoned cash payments because a cellphone can pay for anything and everything, even a street hawker will accept cashless payments. Alibaba initiated adoption of the "payment in advance" strategy in the Southeast Asian market. Huxiu noted in a January's report that online payments are so common in Sabah, Malaysia, that scanning a code could allow a customer to transfer money for anything from exchanging local currency to buying an ice cream. Even if there are more vendors starting to adopt electronic payments, Candy doesn't see a great number of Singaporeans using WeChat to pay in her home country, even though some stores provide online payment via WeChat wallet. "I have seen signs for WeChat and Alipay in Singapore in some clothes stores, like H&M, but as far as I know not a lot of Singaporeans use WeChat to pay," she told the Global Times on Tuesday. The biggest reason is that Singapore has already established their methods of payment, and in addition, lots of local banks give discounts if they use their card. 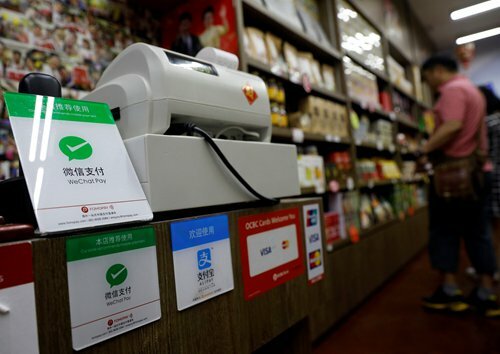 For Chinese e-commerce giants, they are also facing difficulties of "geographical isolation" with the payment license from the local governmental and financial institutions. Alibaba's affiliate Ant Financial worked hard to cooperate with a local electronic company in Southeast Asia, said Huxiu. The report added it took two years for Lazada to be granted an electronic payment license. Such a result requires approval from both local governments and financial institutions. In terms of the marketing strategy of Chinese e-commerce giants in Southeast Asia, Candy suggested they need to "find a way to reach the different ethnic groups equally." She took Singapore as an example, suggesting more red outfits during Chinese New Year and more Hindu colors for Deepavali on the online shopping platforms, since the local population celebrate these as public holidays, which might be great business opportunities for e-commerce companies.